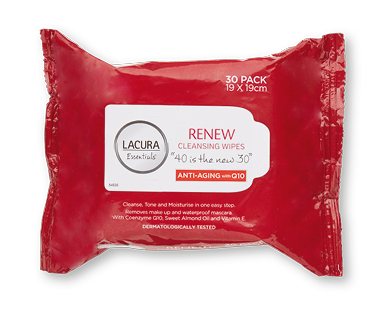 LACURA® Essentials Renew Cleansing Wipes are enriched with Coenzyme Q10 which help to promote the energy supply of skin cells, therefore helping reduce the appearance of fine lines. They also contain the additional benefits of sweet almond oil, vitamin E and aloe vera to help cleanse, tone and moisturise in one easy step. Use everyday to remove make up including waterproof mascara. Your skin will be left feeling radiant and youthful.